Science Fiction Weekly Vol. 1. No. 10 2574 Bedford Ave Brooklyn, N.Y. APR. 21,1940 5 [cents sign] AMAZING STORIES QUARTERLY THE TENTATIVE TITLE of a quarterly science fiction magazine soon to be published by Ziff-Davis, is Amazing Stories Quarterly. It will not be the oldtime quarterly revived, however; the format will be the same as that of the monthly; 250 pages of complete science and fantasy fiction. 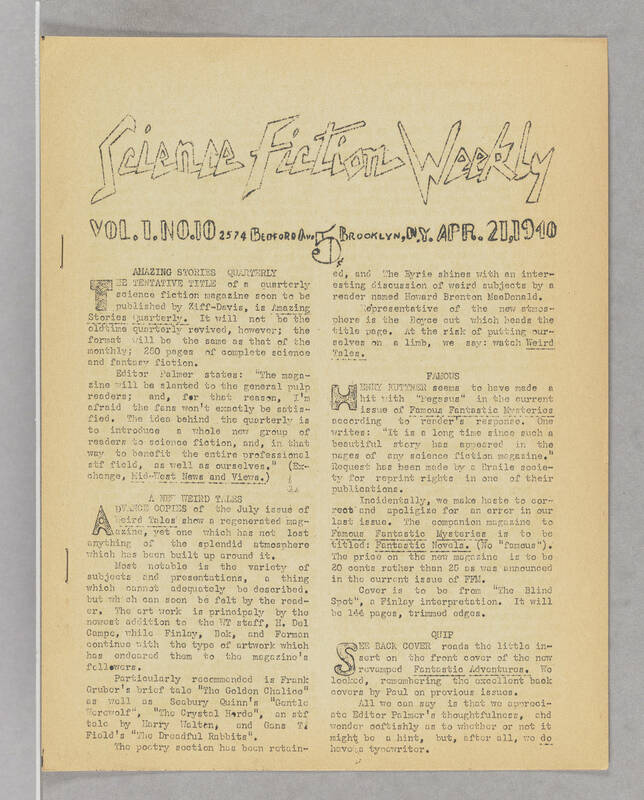 Editor Palmer states: "The magazine will be slanted to the general pulp readers; and, for that reason, I'm afraid the fans won't exactly be satisfied. The idea behind the quarterly is to introduce a whole new group of readers to science fiction, and, in that way to benefit the entire professional stf field, as well as ourselves." (Exchange, Mid-West News and Views.) A NEW WEIRD TALES ADVANCE COPIES of the July issue of Weird Tales show a regenerated magazine, yet one which has not lost anything of the splendid atmosphere which has been built up around it. Most notable is the variety of subjects and presentations, a thing which cannot adequately be described. but which can soon be felt by the reader. The art work is principaly by the newest addition to the WT staff, H. Del Campo, while Finlay, Bok, and Ferman continue with the type of artwork which has endeared them to the magazine's followers. Particularly recommended is Frank Gruber's brief tale "The Golden Chalice" as well as Seabury Quinn's "Gentle Werewolf", "The Crystal Horde", an stf tale by Harry Walton, and Gabs T. Field's "The Dreadful Rabbits". The poetry section has been retainer, and The Eyrie shines with an interesting discussion of weird subjects by a reader named Howard Brenton MacDonald. Representative of the new atmosphere is the Boyce cut which heads the title page. At the risk of putting ourselves on a limb, we say: watch Weird Tales. FAMOUS HENRY KUTTNER seems to have made a hit with "Pegasus" in the current issue of Famous Fantastic Mysteries according to reader's response. One writes: "It is a long time since such a beautiful story has appeared in the pages of any science fiction magazine." Request has been made by a Braile society for reprint rights in one of their publications. Incidentally, we make haste to correct and apoligize for an error in our last issue. The companion magazine to Famous Fantastic Mysteries is to be titled: Fantastic Novels. (No "famous"). The price on the new magazine is to be 20 cents rather than 25 as was announced in the current issue of FFM. Cover is to be from "The Blind Spot", a Finlay interpretation. It will be 144 pages, trimmed edges. QUIP SEE BACK COVER reads the little insert on the front cover of the new revamped Fantastic Adventures. We looked, remembering the excellent back covers by Paul on previous issues. All we can say is that we appreciate Editor Palmer's thoughtfulness, and wonder ooftishly as to whether or not it might be a hint, but, after all, we do have a typewriter.